Various selection of pictures from 1998 in My Driver's License. Click on pictures for medium view. Right-click/save to save and/or view different resolutions. Oi! Look at me! 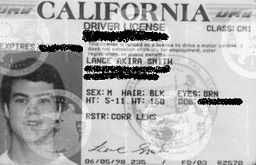 This is my driver's license I got in the summer of '98 but the picture is from 1996 when I got my M1 addition. And I think that's my signature when i was 16. Wow, it's legible!